Yamaha RX-A3070 review | What Hi-Fi? When we first tested the Yamaha RX-A3070, the company’s flagship AV receiver, back in October 2017, we were disappointed by its uncharacteristically lacklustre performance. We’re not used to seeing anything less than five-star AV amps from Yamaha at this end of the market, so three stars was a shock for everyone involved. Citing a possible faulty unit, Yamaha has recently supplied us with a fresh sample of the RX-A3070, which has also seen the price drop from its original £2200 to £1600. Thankfully, it’s good news as there’s a noticeable step up in performance from our original sample. Big, powerful, muscular – these are Yamaha characteristics that we’ve come to know and expect over the years. And if you love that aspect of Yamaha’s sound, you’ll be pleased to know that the RX-A3070 has all of those traits. Its brawny nature and huge reserves of low-end rumble suit Mad Max: Fury Road perfectly. War drums thud with a purpose. Engine roars dig deep and sound throaty. And you can feel the weight of each modified rig as they race and crash against each other on screen. It’s the kind of surround performance that envelops you completely. Not just because of the sheer volume and scale the receiver can guarantee, but also because it’s great at steering surround effects around the room. Play BBC’s Planet Earth II, and you can pinpoint exactly where the birds are as they swoop around the landscape. The surround field is vast and open, and the receiver does a fantastic job of positioning surround sounds accurately across the speakers. More than once, we had to stop ourselves from looking behind us when there was a rustle of leaves or a bird squawking. There’s enough detail on offer that the sizzling sea spray and waves crashing against the rocky islands sound realistic. The issues we had with our original RX-A3070 sample were with how it handled dynamics and detail – it just wasn’t as precise or expressive enough. Voices had a reedy quality, there was a hard edge to the sound, and it lacked agility and nuance. All this has been addressed in the new, more solid-sounding sample. The previous hard edge is gone, and while it still isn’t the last word in subtlety, the amp is more entertaining to listen to. It’s a more agile sound – sound effects and music move along in a snappier manner, and dynamic peaks and dips are more dramatic. The nail-biting snakes and iguanas chase scene from Planet Earth II is punchier through the new RX-A3070 – the heart-pounding silences make an impact this time. We’d still like to hear a tad more texture and depth, especially with voices, as the rival Denon AVR-X6400H (which has also gone down in price since we first tested it) still wins out when it comes to building up tension and pulling at your heartstrings. We certainly don’t feel as emotionally detached as we did with the original sample. The midrange sounds more solid and filled out, however voices still sound far more fleshed out and realistic on the rival Denon. The A3070 is admittedly grander and more muscular than the Denon, and that’s an approach that will please many surround sound fans. There’s nothing revolutionary about the RX-A3070’s design. It’s a large, burly box that feels like it will stand the test of time, and that’s exactly what we want from a top range AV receiver. It’s almost identical to last year’s RX-A3060, which feels a little uninspired, although we can’t argue with its sturdy build quality. It comes in either black or titanium finishes, with a neat aluminium front panel. Buttons and dials work well and the remote control is decent, although a backlight would be useful. The front-panel display is crisp and legible, while the on-screen menus are fairly easy to navigate around. Set-up is a simple matter of plugging in the supplied mic and running the auto calibration, which is swift and largely accurate. The process isn’t quite as newbie-friendly as Denon’s guide to its calibration, but it does the job. As always, we’d suggest heading into the manual speaker settings to adjust the levels where needed. One thing to keep in mind is if you have a Dolby Atmos system, you’ll need to go into the manual settings to let it know exactly what kind of speakers (in-ceiling or Atmos-enabled) you’re using, before running the calibration process. You’ll find the connections at the back of the receiver, from multiple digital and analogue inputs – including MM phono and balanced XLR. There are eight HDMI inputs (and two outputs), all of which adhere to the latest HDCP2.2 standard required for playing all Ultra HD 4K and HDR content. They also support Dolby Vision HDR and Hybrid Log Gamma (HLG) formats. As you'd expect from a high-end receiver, the RX-A3070 supports three-dimensional Dolby Atmos and DTS:X soundtracks. The flagship features nine channels of amplification, so it’s capable of playing a 5.1.4 Atmos configuration (or 7.1.2 if you prefer). 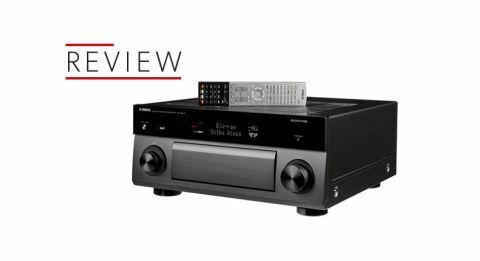 To get 11 discrete channels and a 7.1.4 Atmos setup, you’d need to add a stereo power amp to the Yamaha, whereas its rival, the Denon AVR-X6400H, will power the whole lot out of the box – and adds a few extra connections into the deal. Mind you, with the hefty price drop, the Denon is also now more expensive. Regardless, the Yamaha is well specified on both movie and music fronts. There’s native support for a few more streaming services – Spotify Connect, Tidal, Deezer and Qobuz – than you’d get on the Denon AVR-X6400H. Bluetooth, AirPlay and wi-fi streaming come as standard, and the amp handles hi-res audio up to 24-bit/192kHz and double DSD files. And if you’re planning to have a Yamaha-only household, you can enable multi-room streaming across products through its proprietary MusicCast technology. This Yamaha RX-A3070 has had quite a journey, but there’s no denying its ambition when it comes to scale and power. It still has some ground to cover when it comes to outright nuance, but it ticks plenty of boxes, and delivers an energetic and capable performance that feels more in line with its new price, and its heritage. The RX-A3070 is clearly at home with thunderous impact and impressive special effects, and for many AV fans, that powerhouse performance will thrill with the right system.